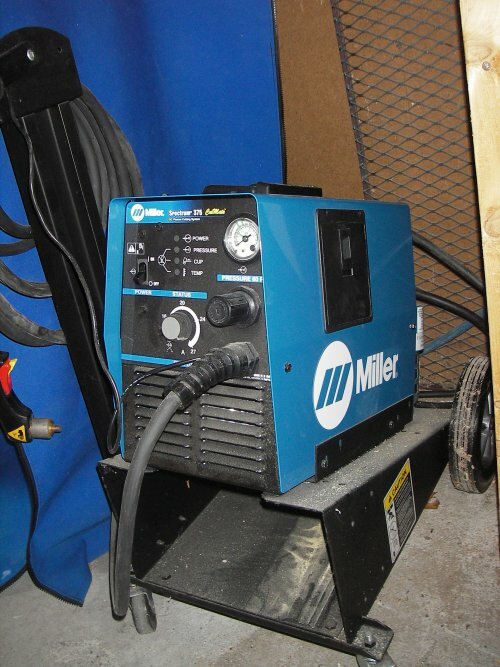 The Miller Spectrum 175 plasma cutter. If you are doing alot of work in metal and need it done fast and not so pretty, I can not stress enough the importance of having a plasma cutter. I thought it was a bit extreme to have one with the low volume work I do. Until I got a job that required me to drill 60 + 1/2" holes in 1/4" steel. It would have took me days and many drill bits to accomplish that. Instead, I made a 3/4" hole in a template and used it to trace holes with the plasma cutter. Not as clean as a drill bit but it's hard to argue with 3-5 seconds per hole.